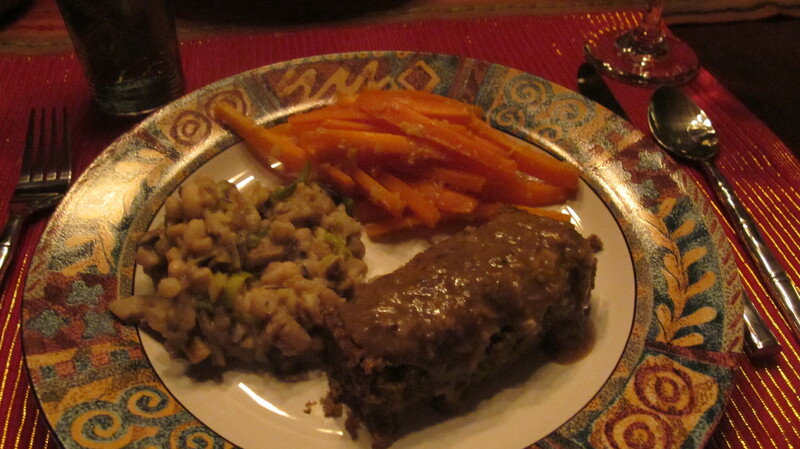 This delicious gluten-free loaf adorned with mushroom gravy was a gift from my Valentine, Roger Gilles. The photo elicited so many requests for the recipe that I’m posting it now in anticipation of the landslide of requests we’ll get at our supper club this evening. If you’re free, come over and try it! This came from ExtraVeganZa, by Laura Matthias, p. 106. I wasn’t sure if the 2 cups of rice meant before or after cooking, so I started with 2 cups of uncooked rice and then used about 4 cups of cooked rice, which seemed about right. Also, in place of fresh basil, I used two “cubes” of frozen basil blended with olive oil—which Sue makes in the summer in ice-cube trays and then puts in our freezers. This was very easy to make. Cook the rice. Preheat oven to 325 degrees. Blend all ingredients in a food processor until reaching a coarse consistency. Press mixture into an oiled loaf pan. Bake 60 minutes. Allow to cool 10 minutes before turning onto a dish and slicing. This came from Veganomicon, by Isa Chandra Moskowitz and Terry Hope Romero, p. 211. I used a blend of shiitake, oyster, and baby bella mushrooms. I also used brown rice flour because Sue wanted the meal gluten-free. After sautéing the onion and mushrooms (but before adding the garlic, etc. ), I whirled the mixture in a food processor, even though the recipe didn’t say to. I wanted a smoother gravy. Mix flour into broth and set aside. Sauté onion in oil, then add mushrooms and sauté. Add garlic, thyme, sage, salt, and pepper, and sauté some more. Add wine and bring to simmer. Lower heat and add flour/broth. Stir until thickened, about 5 minutes. ← Bean Can Man to the Rescue! I’ll be there to try it tonight at your Supper Club. Oh my, really does look lovely!